Capture the tiniest of details with lifelike clarity thanks to the XAVC S recording format, which enables high bit rate recording of up to 50Mbps. This heightens the precision and clarity of Full HD images, while suppressing compression noise, so you can always count on top video quality. Shoot action-packed scenes with unsurpassed stability when you use Sony's Optical SteadyShot™ in Intelligent Active Mode. Using the latest in optical image stabilisation technology, it is able to detect and correct camera shake blur to maintain incredible levels of detail and clarity. Its stabilisation prowess is up to 13x*1 more effective during wide-angle shooting compared to an Optical SteadyShot™ in standard mode, so you can record smoothly even when zooming in on a distant mountain scene, or chasing after a toddler on vacation. *1 Compared to standard mode. The image stabilisation effect may vary depending on shooting conditions. Experience stunning low-light performance with the HDR-CX405 HD video camera thanks to the back-illuminated Exmor R™ CMOS sensor. The unique back-illuminated technology powering the sensor enables it to utilise incident light more efficiently, doubling its sensitivity compared to conventional CMOS sensors. The result is a clearer, sharper image and drastically reduced noise even when shooting in dimly lit environments, whether in a party or out under the stars. This high-performance ZEISS® Vario-Tessar lens delivers outstanding resolution, contrast, and colour rendition, contributing to overall image quality that is at the top of the class. Experience sharply detailed photos of a brilliant spectrum of shades with every snap. recorded at the same quality as when shooting at lower magnification. Experience crisp sharpness in your photos – even after magnification of up to 60 times. Save time by quickly finding your highlight points and start editing immediately. Highlight Movie Maker will also take the best scenes automatically and create a highlight movie complete with background music. You can also share your work immediately via smartphone. Explore different effects and widen your creative expression with Picture Effects. Tweak the brightness, colour, vividness and texture according to your preference and enjoy the results on screen after a round of shooting with 13 different effects in total, including 6 new ones – Toy Camera, Soft High Key, Partial Colour, Miniature, Watercolour and Illustration. Transform every scene into the work you've envisioned. With three times the processing speed of earlier models, the new BIONZ X™ image processor reproduces textures and details in real life, and suppresses visual noise in specific areas to ensure sharp images. This results in realistic images with rich tonal gradations and a natural three-dimensional appearance. Be instantly recognised by your smile. Smile Shutter — adjustable in three levels — automatically takes a shot when smiles in the scene are at their brightest. When shooting scenes of people, Face Detection technology will automatically optimise focus, exposure, and colour for the best results. Moreover, you can also select the person to be prioritised by Face Detection simply by touching the face of the person on the screen, so the key person you want to capture will always be the main focus of your shots. Mic Level Control provides greater scope for sound effectiveness when shooting videos. From low birdsong to loud band performances, users can easily set the input level depending on the situation. Even when the sound level increases suddenly, Auto Gain prevents the sound from breaking up and eliminates distortion. Preserve every precious memory with dual video recording – a convenient function that allows simultaneous recording of AVCHD movies in Full HD for film-like results and MP4 format for easy sharing with friends and family. 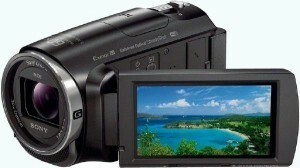 Dual video recording is also available for the combination of high-quality XAVC S and MP4*2. Instantly transfer MP4 movies to your mobile device, allowing instant uploading to websites. *2 Dual Video Recording doesn't work in "AVCHD PS" mode or "XAVC S HD 50p" mode. Trace every split second of the action with Motion Shot Video, an intelligent feature that captures the moving subject in a sequence of images showing the trajectory of motion. Superimposed on a single image in playback, Motion Shot Video serves as a powerful tool to analyse that important golf swing or goalkeeper save.